Now that the 10.5-inch iPad Pro has been in stores for a while, we're beginning to see more accessories for the device. Since not everyone needs a keyboard case, we decided to take a look at the Moshi VersaCover for the 10.5-inch iPad Pro (US$54.95). 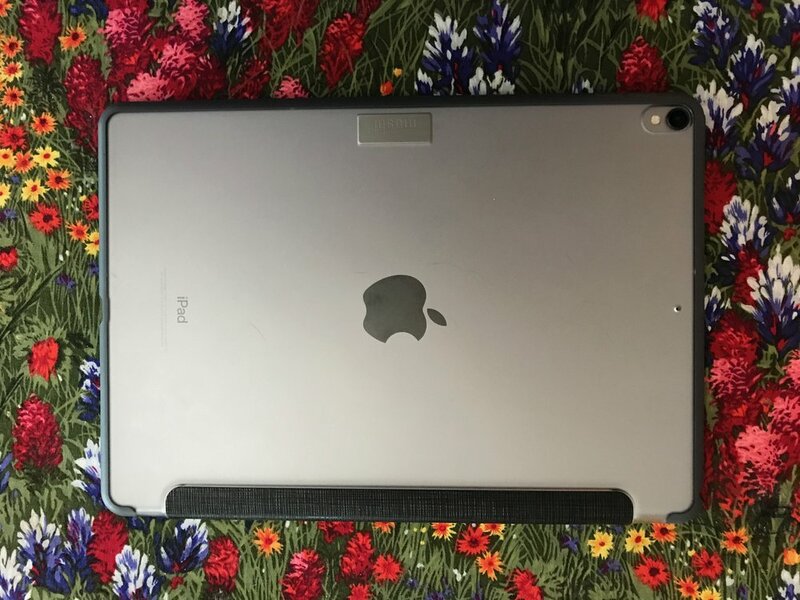 This case is not only a protective cover for your iPad Pro, but also acts as a stand for watching movies, typing on the screen, or engaging in FaceTime conversations. Available in black or "Sakura Pink", the VersaCover features a microfiber interior and a textured polyurethane exterior -- that's the origami-like folding stand portion that covers your screen. The back side is a clear polycarbonate that protects the back of the iPad Pro while displaying the back of the device. The iPad Pro is held securely in a polycarbonate frame with ports for the speakers, Lightning cable, and headphone jack. The frame also has passthrough switches for power and volume, as well as an opening for the iPad Pro's camera. But the true genius of the VersaCover is in the folding cover that turns into a stand with three different angles -- 40° for typing on the device, 50° for reading, and 60° for watching movies. In the cover are powerful and tiny magnets that stick together. Fold the cover so that those magnets are touching and you've enabled all three angles of the stand. This is also one of the lightest and thinnest iPad Pro cases I've reviewed. It weighs just 6.77 ounces (192 grams) and has exterior dimensions of 10" x 7.01" x 0.55" (25.4 x 17.8 x 1.4 cm). So, how does the VersaCover work in reality? Very well! Now, you have to understand that I've been using a bulky Logitech Slim Combo keyboard case with my 10.5-inch iPad Pro, and I'm about to just start using the VersaCover and the iPad's virtual keyboard instead. Why? This case offers all the protection the iPad Pro needs without that bulk and unnecessary weight. Even the topologically-challenged person will quickly figure out how the folds work, and Moshi even provides instructions for an "expert mode" where one can "flick-fold" the case. So goodbye bulky keyboard case! I'm divorcing you and going with the thinner, lighter VersaCover. My only negative? The fact that in certain "modes" the iPad Pro seems to bounce a little bit when you tap on it. I think that will go away once the cover has been flexed a bit more and loosens up a bit.